The Rebel Sweetheart. : The madness known as Moving Day. We know about Black Friday, Boxing Day, Cyber Monday... But have you ever heard of Moving Day? Yes, there is such a thing. It's a tradition in the province of Quebec, Canada, and it falls on the same day as Canada Day, which is July 1. 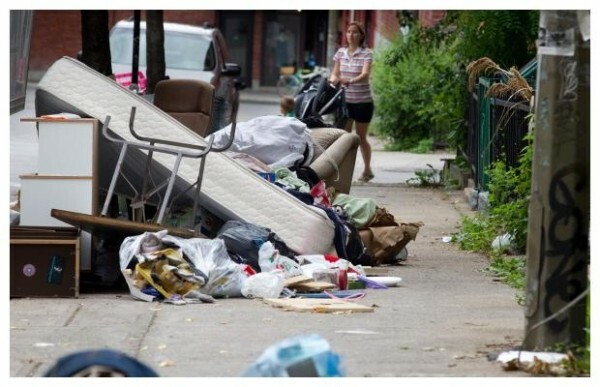 So while most Canadians sit back, relax, and commemorate Canada Day, the people of Quebec sweat, grunt, and tire themselves out from all that moving. A tradition that dates back to the French colonial era, Moving Day is that time of the year when tenants who wish to vacate their current premises move out and settle into new domiciles. It's also the day moving company Montreal look forward to, and dread at the same time. The madness that is Moving Day. Movers Montreal are the busiest during this period of time, with the movers hustling, bustling, and working round the clock. With so many families moving out of their houses simultaneously, moving companies often run shorthanded, hence they tend to charge double, sometimes even triple their usual rates. As of 2002, only 36% of the people in Montreal own their home. The rest are tenants, and are most likely to partake in the annual moving madness. Unless they now have houses of their own, that is. Moving day!!! !hahaha,sound nice,ACTUALLY i always LOVE TO MOVE FROM PLACE TO PLACE. The moving companies working load must be nightmarish but I'm sure they love this time as it's tradition and profits would be coming in.